Happy Wednesday everyone! I still can't get over the fact that it's September and Labor Day is less than a week away! Part of me is very excited as fall is my favorite season, but another other part is just not ready for summer to come to an end. You've probably noticed that I've been incorporating a lot of fall pieces into my outfits on the blog lately. as now is the time to start transitioning your wardrobe, and this faux leather skirt is the perfect piece for taking you from summer to winter. Wear it now with a little tank, or a light weight button up as I did here, then pair it with a chunky knit later in the season. Another thing I've been wearing a lot lately are scarfs and silk neck ties. Draping a light weight scarf over your top, or wearing it around your neck is an easy and chic way to update your outfit for fall. Plus they add a little bit of warmth when the temperatures start to drop. What are some of your go to pieces for transitioning your outfits? This look is so cute! I love the skirt and the skinny scarf. How cute is that skirt?! I love those pumps too! Looking great! I like this outfit very much! Love the skirt and shirt together! You look very pretty! Love the black skirt with the striped top! I have similar pieces and you've reminded me that I need to take them out for a spin! loving those heels! you look so chic and cute! So obsessed with your bag! I recently got a fringe black purse and literally wear it all the time. If you look at most of my blog posts it is featured everywhere! Such a pretty look! love the fringed skirt! Definitely needing a leather skirt in my closet! Loving this one! You look fab! Total babe with your leather mini and heels. Great look and perfect way to transition to fall! You look amazing!! Obsessed with this whole outfit!! That bag is perfection! Love this entire look, would be perfect for an evening out! Great look - loving that fringe bag! This is such a great look! Love your leather mini and that fringe bag! 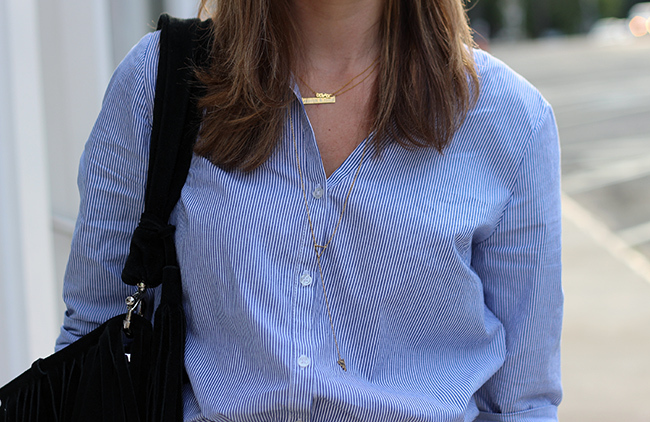 Such a great transitional look! That scarf and fringed bag are amazing. Love this pretty look, I was just reading in a magazine tonight that skinny scarves are going to big this fall. Looking stunning as always!